Considering to make the transition to digital textile printing? The extensive investment of digital textile printing is one of the main reasons printers can be hesitant in making the transition. But how much does digital textile printing truly cost? And – more importantly – what are the benefits? In this article, we discuss both the costs as well as the earnings of digital textile printing. Digital textile printing machines require a higher investment than conventional printing machines. When comparing the total cost of ownership (water, energy, operators, service costs, ink, post-treatment of the fabric, etcetera) between conventional printing and digital printing, digital textile printing of one meter of fabric is around 1,5 times as expensive as conventional printing. In digital textile printing, there are two different kinds of printing techniques available: multi-pass scanning printing and single-pass printing. Multi-pass scanning textile printing means that the print heads move from left to right over the substrate (hence the name 'scanning'). For multi-pass scanning printing only a few print heads are needed to get the desired outcome. This reduces the investment costs of a multi-pass printer. Single-pass printing is a newer printing technique that enables faster printing at a higher quality. However, to enable faster printing, more print heads are needed. Single-pass printing is therefore more expensive than multi-pass printing because more print heads are needed to cover the whole width of the printer. Since print heads are expensive components, the more print heads there are incorporated in the printer, the more expensive the printer will be. Also the additional costs of driving electronics for these print heads add costs to the printer. Digital textile printing machines require the use of a different type of ink. In digital textile printing, the ink is printed onto the substrate by numerous tiny nozzles inside a print head. This printing process requires the use of ink with a higher runnability to prevent nozzle blockages and print head failures. On top of that, digital textile printing enables high quality printing but only when ink with a large colour gamut is used. They also need to be extremely pure to prevent corrosion to the heads. So an extra purification step is essential in the production. Because of these special characteristics, digital inks are more expensive than inks for conventional printing and therefore increase the costs of digital textile printing. The additional investment of digital textile printing also offers textile printers a number of valuable advantages that help save costs or generate new income. Conventional printers have to be handled by several operators, because of the many manual tasks that have to be performed during the printing process. As a result, conventional printing involves high labour costs. 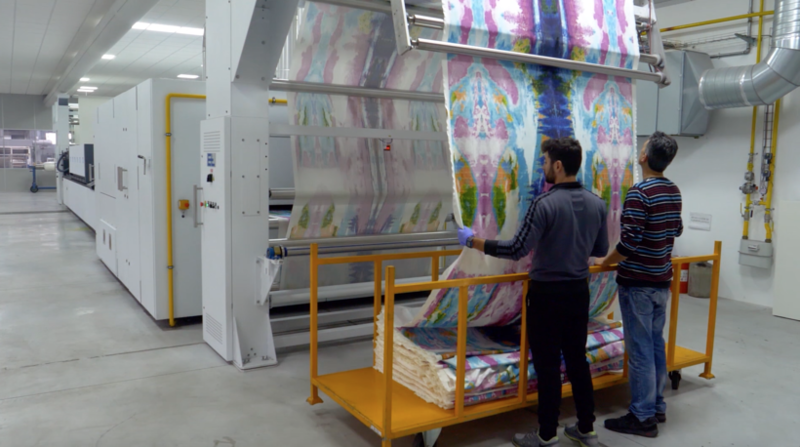 Digital textile printing machines, however, are almost entirely automated, which means only one or two operators have to be present to handle the machine. This number goes down to less than one operator per machine if you run multiple machines, as operators can run more than one machine simultaneously. Therefore, making the transition to digital textile printing can help printers save on labour costs. In digital textile printing, a digital design is printed directly on fabric. No rotary screens are needed. This does not only saves printers valuable engraving time, printers also spare the additional costs of the screens themselves plus the engraving of the screens. SPGPrints’ digital textile printers are equipped with the Archer technology, which reduces print head damage by positioning the print heads further away from the substrate. For this reason, the Archer technology helps you to extend the life-span of the print heads and save on repairing costs. Since print heads are one of the most expensive parts of a digital printing machine, extending its life-span can over a period time save printers a substantial amount of money. With the help of digital textile printing, printers can increase their production rate and shorten their turnaround time. This enables printers to ensure a faster delivery and keep up with their customer demands, but also take on more printing jobs. It has been proven by digital textile printers that serve fast fashion brands, that those brands are willing to pay more for a meter of fabric when it is delivered in a few days instead of a few weeks. So the additional costs of digital textile printing can be charged to your customer to a large extend. Because of the long turnaround time of conventional printing, fashion brands need to estimate the metres of fabric they will sell and base their printing job on this estimate. However, since digital textile printing accelerates the printing process, it enables fashion brands to print small batches and place repeat orders when a certain type of clothing is selling very well. In the ideal situation, with help of digital textile printing there is no such thing as “discount sales” anymore in the future because fashion brands can rapidly have the desired amount of textile printed. Although digital ink is more expensive than ink used for conventional printing, the digital printing process - and the Archer technology in particular - helps printing companies to decrease their ink usage. the ink usage of the Archer technology is 20 percent lower than other printing technologies. This way, the Archer technology helps you to reduce your ink usage and save costs. Does reading about the earnings of digital textile printing make you want to witness the advantages of this technology in real life? Find out what the true power of digital printing is by scheduling a visit to our digital textile printing Experience Center.